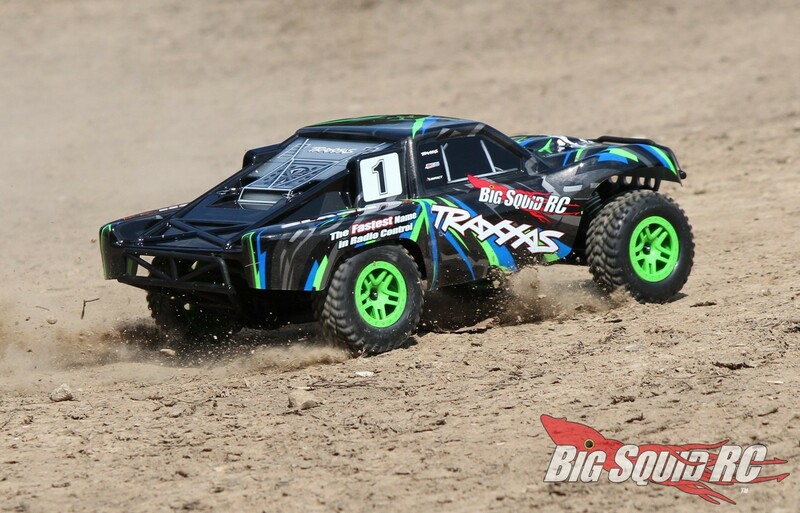 Traxxas Slash 4×4 Brushed XL-5 Review « Big Squid RC – RC Car and Truck News, Reviews, Videos, and More! 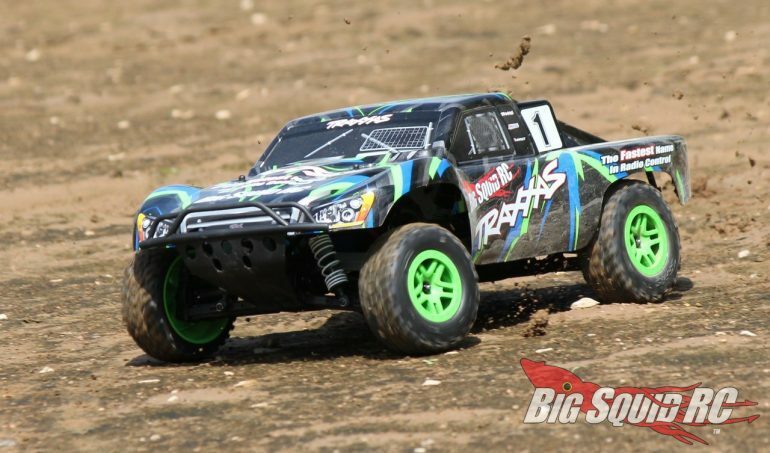 Primary Competition: The Slash 4×4 has loads of competition from trucks like the ARRMA Senton, ECX Torment 4×4, Losi SCTE, etc. What’s Needed To Complete: Not much as you’ll only need to supply four AA sized batteries for the transmitter. Otherwise, the truck comes with a 7 cell NiMH battery, plus a 4 amp charger, to power the truck. Build Quality: After passing the Slash around the room we did not find any fault with its build quality. The spur/pinion mesh was fine, the shocks were properly filled and not leaking, the tires were well glued, etc. Test Drivers: For the Slash we busted out our trusty but not rusty test crew of Iron Mikeee, Robbie G., T-$$$, and yours truly. 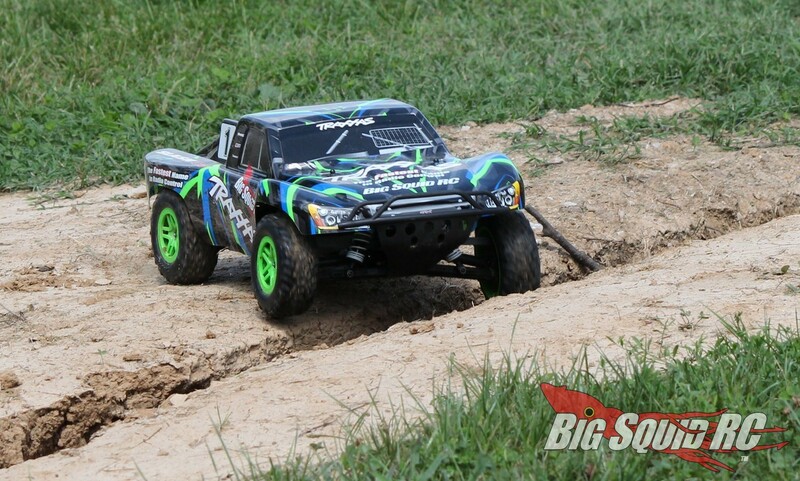 Test Venues: We tested the Slash 4×4 in the greater St. Louis Missouri metro area, but many of our local parks were closed due to flooding. We managed to find plenty of spots to bash (at drier spots in our local city parks), but many of our favorites were 10 feet under water. Sigh. 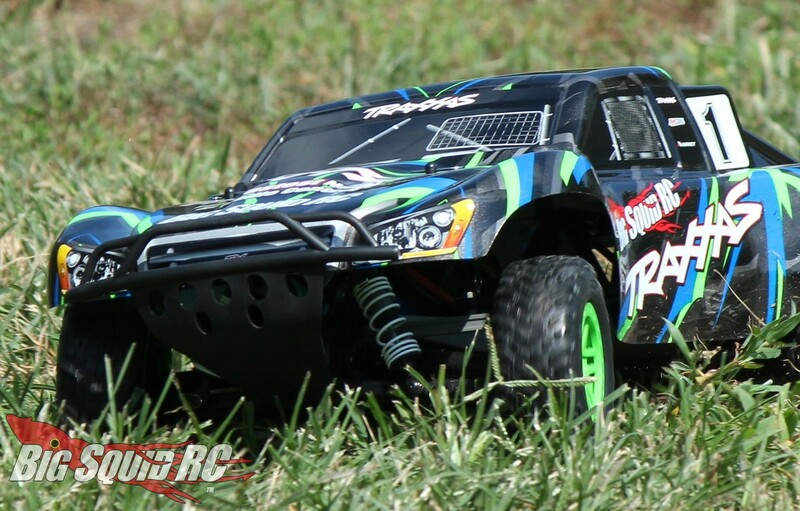 Set-up Notes: We “mostly” ran the Slash 4×4 box stock, with the exception of batteries. We used a Traxxas 2S 5000mAh LiPo for the majority of our driving, but also got in a handful of runs on the included NiMH. 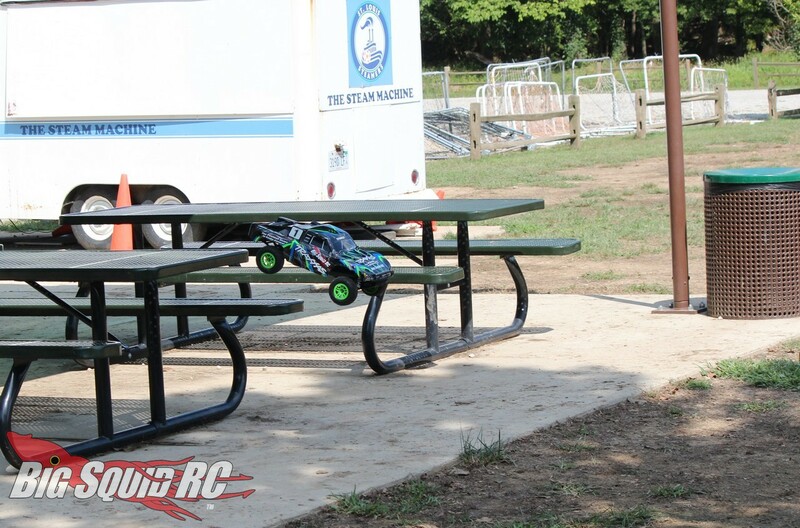 Also, we skipped the included charger in favor of using a Traxxas EZ-Peak Live. 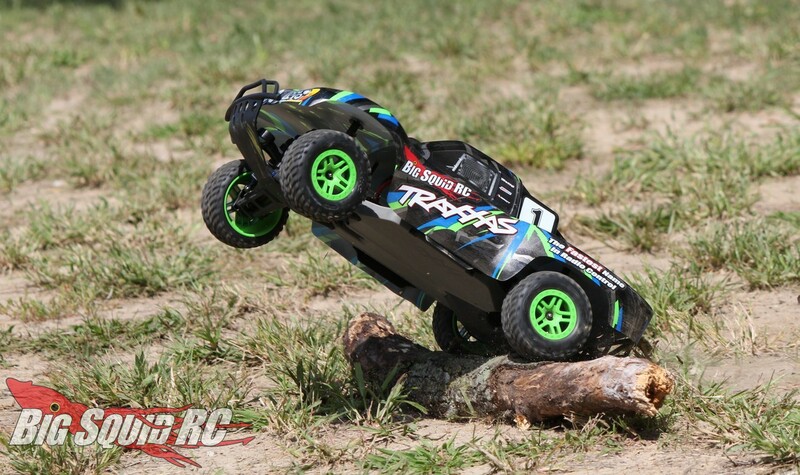 Turning: The Slash 4×4 comes set-up for noobies out of the box. The truck generally has a slight push going into corners on lower grip surfaces, but can traction roll when its tires get hooked up. We found that our truck rarely traction rolled in normal driving, and generally cornered well, especially for new drivers that always tend to oversteer. 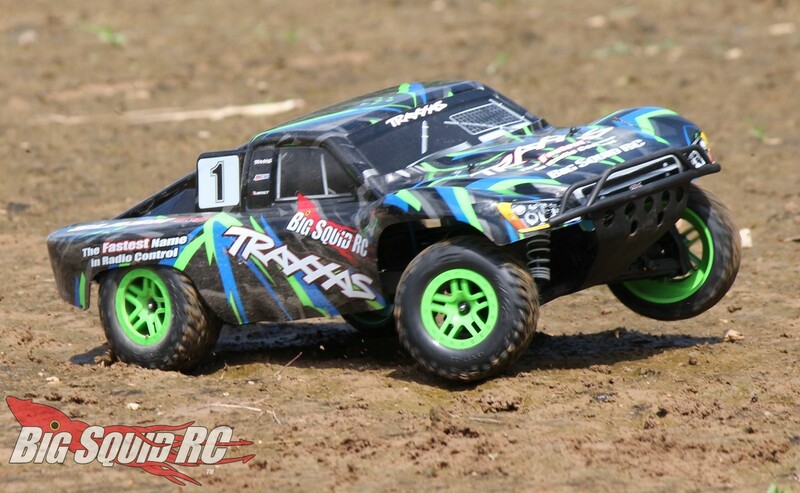 The combination of the Slash 4×4’s slight push, along with a tame servo, helped make the truck easy to drive in corners. More experienced drivers were looking for a faster servo to “quicken up” the turning, but the steering worked well enough that none of them were in a big hurry to hand the transmitter over to the next test driver, LOL. Jumping: The latest version of the Slash 4×4 jumps much like the previous trucks. 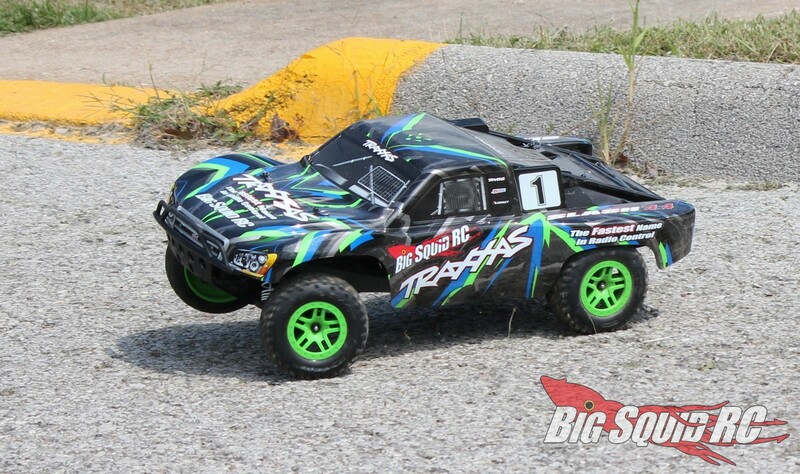 Now, this version doesn’t have crazy power on tap, so you can’t just stab the throttle and pull the nose up like you could on a brushless powered version, but overall the Slash 4×4 is a solid jumper. By the way, the suspension is tuned more for getting grip on dirt, so it is soft when landing from huge jumps, so if all you do is jump, install firmer springs and oil when you get the truck. Bumps/Whoops: The stock springs and damping are on the light side. This helps the truck find traction on loose surfaces, but makes it wallow a bit in the rough. For fast, aggressive drivers, we would recommend going to slightly heavier shock oil (front and rear) to help the truck plow through the whoops with greater control. On-Road: We logged a lot of time on-road with the Slash and had a great time. While not fast, the Slash can basically go anywhere, and does a great job of making even a relatively boring stretch of road fun. The truck doesn’t normally traction roll when driving on pavement, but can do so when catching an edge during a corner. More experienced drivers will want more speed for on-road, but our first time drivers seemed to have a blast as it was. Grass: The tires and 4wd system on the Slash make it cut through typical backyard grass quite easily. Once again, there isn’t a lot of power on tap, but there is more than enough for bashing around in the grass behind your house. 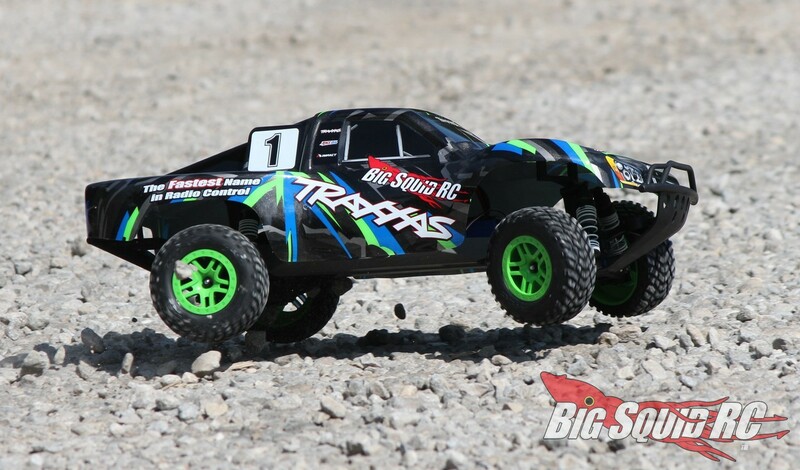 Tires: Oh yes, good old Traxxas Slash tires. The Slash tires have been around a long time, but still have a nice scale look, while also providing solid all-around grip. No, they aren’t the softest tires you can buy, nor the grippiest, but they work fine for backyard bashing. Being a bit harder of a rubber compound allows them to live a long life, but they are soft enough to still provide decent grip on a wide variety of surfaces. Power: This is where the latest Slash 4×4 stands out from the previous units, rare power. Where as the VLX brushless powered Slashes are quite burly for power, the brushed Slash 4×4 produces much softer output. The stock NiMH pack gives the truck a soft power delivery across the board, but popping in a LiPo instantly takes it up a level in power. With the stock brushed system on LiPo, throwing roost is easy and the truck feels quite “peppy” until it hits top speed (which happens quite quickly). On the stock NiMH, it still has enough power to throw some roost, but is tamed down just about perfectly for first time drivers. If speed is your thing, look for a VXL Slash 4×4, if you are a new driver, the brushed/XL-5 Slash 4×4 is just about perfect for power out of the box. It has enough power to be fun, while also being slow enough to make it easy to learn how to drive. 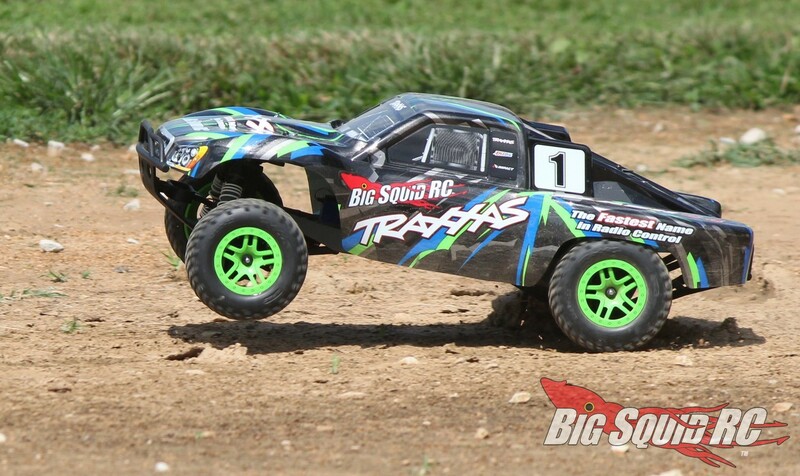 Radio: A standard TQ 2.4GHz radio comes on the Slash 4×4 and it worked well for us. The ergonomics were disliked by some of our testers, but loved by others. In the end, the radio did it job without glitching, and with plenty of range. 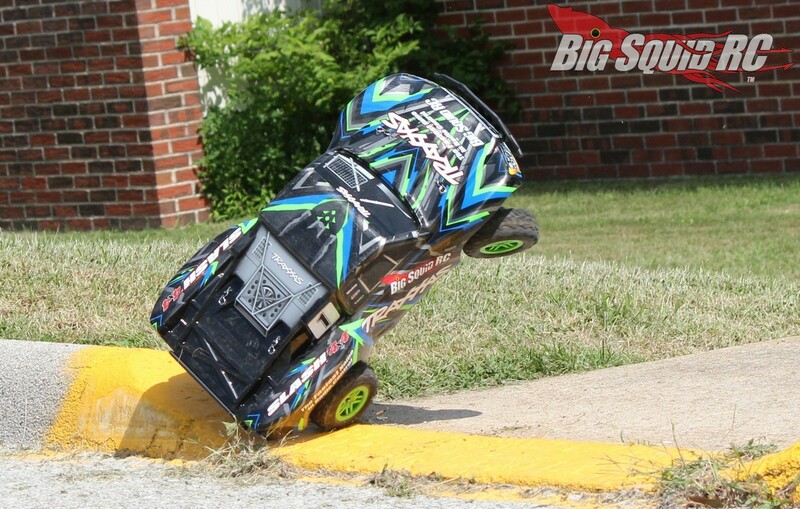 Broken Parts: During “normal” backyard bashing, our test truck held up like a champ. When we took it extreme, we ended up breaking a shock, but overall we found the Slash to be quite durable. OK, so we got a new Slash 4×4 in, and it seems all our test drivers want it for “long term review”. 🙂 What this tells me is, a number of guys on our test crew have project plans for the Slash 4×4, and indeed it is quite a versatile vehicle (with a plethora of aftermarket hop-ups already on the market). The stock Slash is a blast to drive, but it can also be fairly easily turned into a speed run car, a drifter, an oval racer, etc. We had a couple of muggles look at the truck and comment on its paint scheme, in a good way of course. The stock graphics are right on-point and the colors used, look good together. Best Mod: LiPo! If you are a noobie, learn to drive, then slap in a LiPo for a very noticeable boost in power. 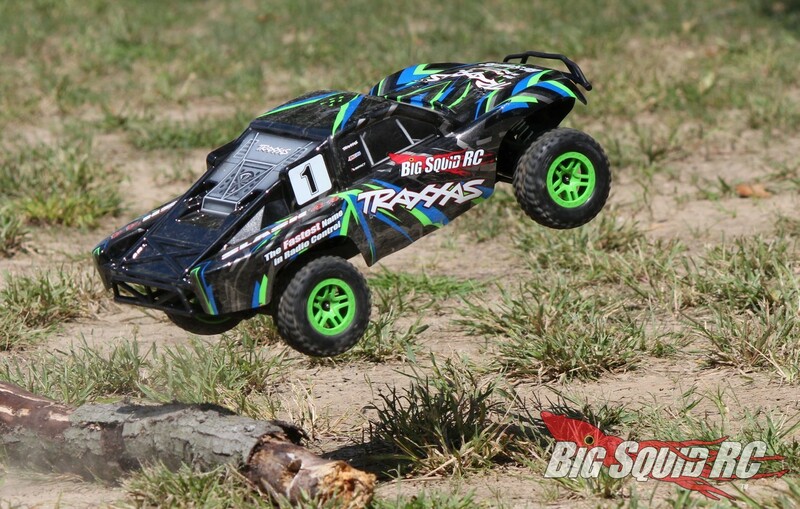 Time To Bash: B The Slash 4×4 was easy to get up and running. The truck comes with a NiMH battery (plus a charger), thus saving you some cash at the check-out counter. Workability: B The Slash 4×4 uses decent quality metric/hex hardware, along with an open layout, to make it easy to work on. Car Show Rating: B With a lid that pops and a scale’ish wheel/tire package, everyone on our Bash Crew liked how the Slash 4×4 looked. It has a classic short course truck look that bashers enjoy. Bash-A-Bility: B Over the years the Slash 4×4 has proven itself as a capable bash machine. 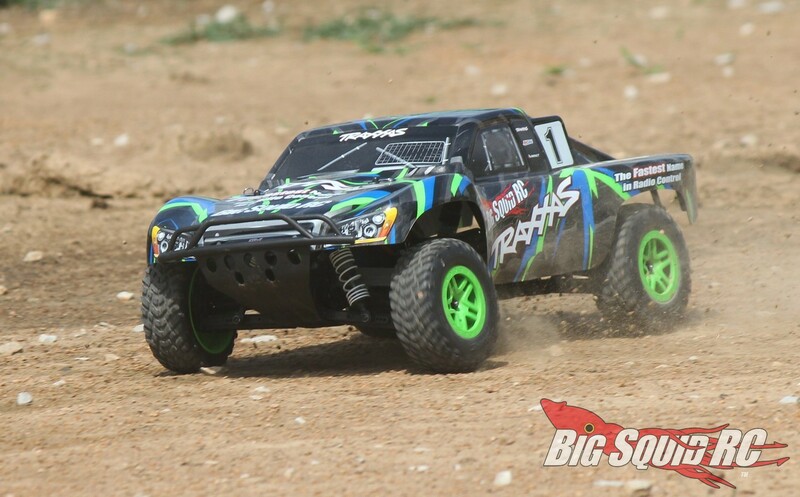 We put the Slash 4×4 through its paces and it took some pretty aggressive driving to break it. Fun Factor: B Noobies gave the truck an “A”, but our experienced testers wanted a bit more power out of the box. Handling: B We found that the brushed Slash 4×4 handled quite well. The truck is easy to drive and a joy to drift through corners. Value: A At just $319 we feel the brushed Slash 4×4 is a truly exceptional value. 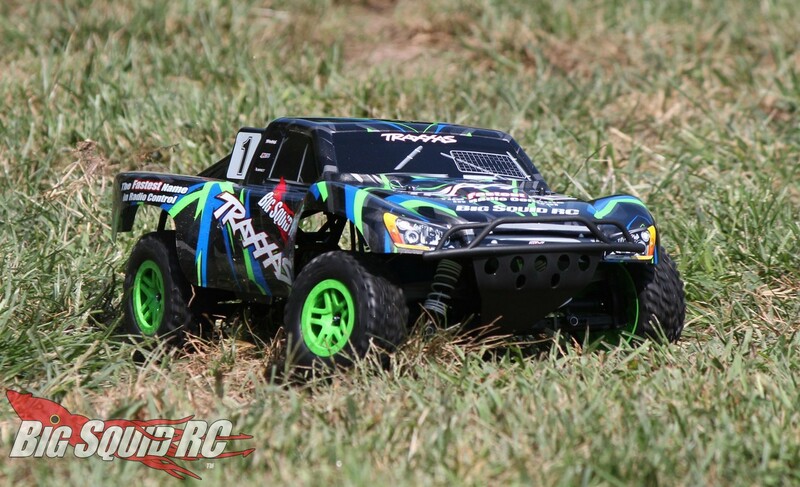 Parts Availability: A Traxxas has long lead the way for parts support and that is no different with the brushed Slash 4×4. We were easily able to find parts for it hanging on the pegs at our local hobby shops. 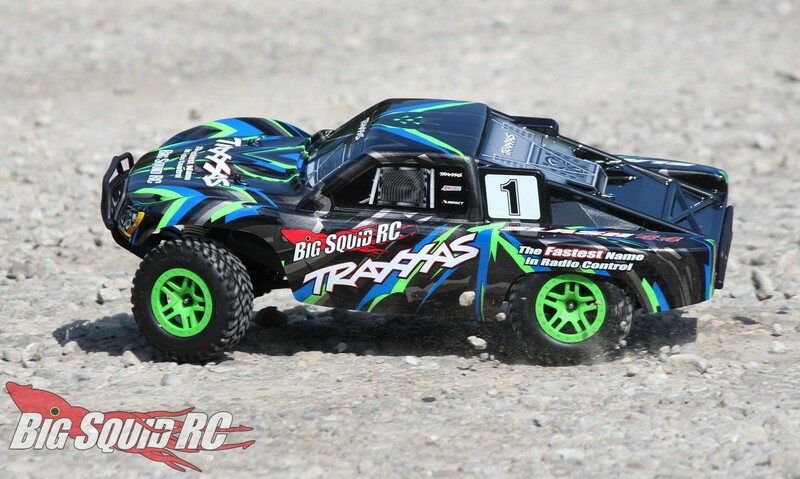 BigSquid Rating: B+ The brushed/XL-5 Traxxas Slash 4×4 is an awesome bash machine, as well being an excellent short course truck. If you are a new driver, both its suspension and power system are set up perfectly for you. 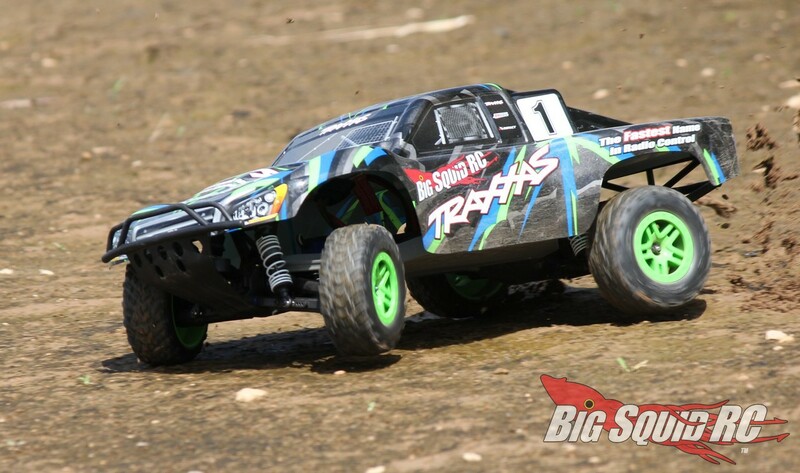 If you are an experience hobbyist, this version of the Slash 4×4 gives you an affordable option when buying a great platform. We see the brushed Slash 4×4 as all sorts of win, cut the check and have an affordable blast!! !